Patient Roland S. with his C-Leg and High Fidelity (HiFi) Interface. The newest innovation in socket design fitted by Sampson's Prosthetic & Orthotic Laboratory is the High Fidelity (HiFi) Interface with OsseoSync™ technology developed by Randall Alley of Southern California-based biodesigns inc. Sampson's prosthetists are licensed and trained to fit the HiFi. The HiFi offers patients improved fit and function because it precisely connects to the residual limb, capturing and reproducing skeletal motion. This differs from traditional sockets where a patient's soft tissue is encapsulated in a generic, bucket-like design, where the bone is allowed to move freely within the socket, uncontrolled. The patient uses a high level of energy to maintain stability and function. In contrast, the HiFi's design consists of four struts, which compress tissue, and an alternating pattern of open areas between the struts to allow a portion of the limb's tissue to escape. This released volume allows the struts to connect closer to the bone, minimizing or eliminating the movement of the bone within the interface so the patient has more control, function, comfort, and overall better performance. Several Sampson's patients are fitted with the HiFi. "We have fitted both upper and lower limb-loss patients and the feedback we are receiving is that it feels more stable and allows them more control of their prosthesis as well as improving their comfort level," said Bill Sampson, CP. "Patients have told me they feel the improvement and are able to use their prosthesis to its fullest functionality. Transfemoral amputees can walk faster with a longer stride and expend less energy, as well as having improved balance when standing. Upper limb amputees can lift and carry heavier loads, raise their arms up higher and also have improved stability. As a clinician, the bottom line is positive patient feedback." Above-knee amputee and Sampson's orthotics technician Mike Tallman was one of Sampson's first patients to be fitted with the HiFi. "With my previous socket design, I was feeling a lot of discomfort and didn't feel I had enough control. I can really feel the improvement with the HiFi. If I didn't have this socket design, I wouldn't be able to use my microprocessor knee to its fullest functionality." The HiFi can be used for prostheses in both upper and lower limb applications with any control system including myoelectric, body-powered, or hybrid, and with any type of suspension system, from self-suspending to auxiliary suspension to elevated vacuum. More energy efficient. It preserves motion rather than absorbing it so that more of the wearer's input is converted to prosthetic output. For more information on the HiFi, contact Sampson's Prosthetic & Orthotic Laboratory. Sampson's now fits the latest in microprocessor-controlled knee technology with the Genium from Ottobock. 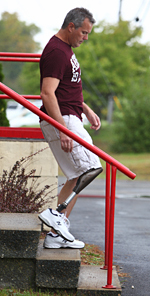 The prosthetic knee closely mimics a natural gait, reducing the mental effort required of users when changing speed, walking up or down stairs, avoiding obstacles, and walking backwards. The Genium's microprocessor technology is twice as fast as the C-leg. Using multiple sensors and two microprocessor controllers, the Genium can read movement at 100 times a second. The sensors automatically adjust, calibrate and transmit to the microprocessor in real time, the bending angle of the knee and bending movement in the ankle. 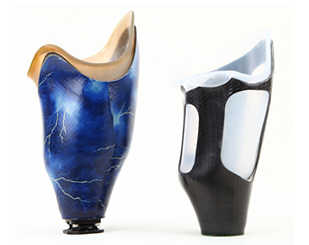 The Genium sensors also allow the prosthetic leg to keep pace with the biological leg, even at different walking speeds on a broad range of terrain. High weight limit of up to 330 lbs. If you have questions, or would like a consultation to see if the Genium is right for you, contact us for an appointment.